US Men’s National Team Returns to Tampa for the 2011 @CONCACAF Gold Cup!!! Hey folks, Jerm here with an update on the Tampa Bay Sports scene! The US Men&apos;s National Team will return to Tampa and Raymond James Stadium June 11 in the 2011 CONCACAF Gold CupTM, as the 2011 groups and schedule were announced yesterday by CONCACAF. 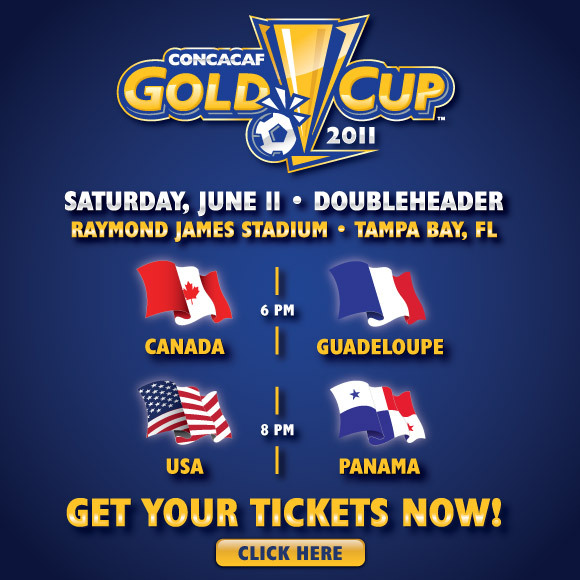 To all of our valued followers, this is your exclusive opportunity to get the best seats in Raymond James Stadium to witness the US Men’s National Soccer Team in the 2011 CONCACAF Gold Cup on Saturday, June 11th in Tampa. Canada will go head-to-head with Guadeloupe at 6:00pm, followed immediately by USA vs Panama at 8:00pm. To purchase your seats to this exciting doubleheader prior to the general public ticket on-sale, simply click here and enter the special presale code: TBSCVIP. This exclusive presale begins at 10am on today and ends at 10am on March 16th. Now is the time to get great seats to catch all of the thrilling action! The 2011 Gold Cup champion and CONCACAF representative to the 2013 FIFA Confederations Cup in Brazil will be crowned on Saturday, June 25 at the historic Rose Bowl in Pasadena, California. Mexico will anchor Group A, which will begin tournament play on June 5 against El Salvador, preceded by Costa Rica and Cuba at Cowboys Stadium. Honduras will lead Group B the following day, facing Guatemala at The Home Depot Center on June 6, with the Caribbean face-off between Jamaica vs. Grenada earlier in the evening. The United States will play the following night, Tuesday, June 7, in Detroit&apos;s Ford Field against its border rival Canada in Group C, which also will include Panama and Guadeloupe. Visit www.goldcup.org for additional details about this spectacular event. Thank you for your support of the 2011 CONCACAF Gold Cup. We look forward to seeing you at the games! That&apos;s all for now folks, but obviously we&apos;ll have updates on this and more as we approach the tournament! Stay tuned in for more updates on sports related things to do in Tampa Bay and Tampa Bay area events!